Who wouldn’t want to witness the earth’s largest animal inland migration, right? 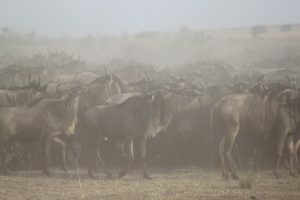 Not only is it a spectacle to behold, but the great migration is also something you couldn’t just casually see anywhere else but Serengeti and Kenya in East Africa! Most people think the Great Migration is an event that happens at a certain time of year. Others think it refers to the intense river crossing in the third quarter of the year. But, did you know that this movement is actually an event that happens all year-round? In this guide, we’ll have the Great Migration explained. Which month is the best to see them? Many safari experts and tour operators highly recommend the months June to October or December to March in Serengeti, Tanzania for the phenomenal river crossings and the unique calving season, respectively. If you’re going to Masai Mara in Kenya, the months July to October are best. But, although long rains may affect game drives during the wet season in April and May, travelers will be rewarded with low safari costs and still a spectacular game viewing experience as well as birdwatching. Due to its phenomenal movement — not to mention all the action that happens in between, the Great Migration is recognized as one of the Seven Natural Wonders of Africa. 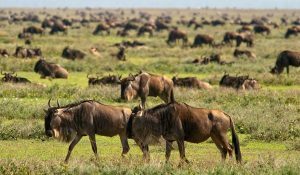 It is otherwise known as Serengeti Migration or Wildebeest Migration and it only takes place in two places: Serengeti National Park in Tanzania and Masai Mara Game Reserve in Kenya. This spectacular event is mainly cast by about two million wildebeests, 200,000 zebras, 500,000 Thompson’s gazelles, and 18,000 elands but you can also see Grant’s gazelles, antelopes, and impalas, all of them looking for fresh grazing and water. Alongside these migratory animals is a bevy of predators that wait for an opportunity to grab some lunch. The usual predators you can spot are lions, hyenas, leopards, cheetahs, and Nile crocodiles. So, you can only imagine the dangers these migratory animals face every day in their journey. Obviously, predator versus prey activity is very typical. 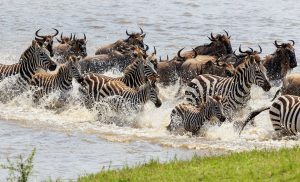 FUN FACT: Did you know that the migratory animals, most particularly the wildebeests and zebras, are able to live harmoniously because they help each other survive? Wildebeests are known navigators. They are excellent in leading to the right direction where the rains or the fresh grazes are. Zebras, on the other hand, are great in sensing danger. They have this innate sixth sense of knowing when predators are coming! You can’t just expect predator vs prey action. Since predators stay behind when migratory animals move forward after their “battle”, predator versus predator interaction is very possible. For instance, a lioness was able to kill a zebra. When the ungulates are gone, it is expected that the lioness and her pride will feast on their new food. But then again, there may be other hungry predators around, too. These predators may end up fighting over food. Certainly, the Great Migration promises a lot of action, drama, suspense, and wonder. So the question now is, if it’s a year-round event, what happens each month? Expect to see approximately 8,000 baby wildebeests being born each day during these months. They are most likely to be seen around Simba kopjes, lakes Ndutu and Masek and even by Goll kopjes and Matiti hill (Kusini). The presence of feeble youngsters and fragile mothers attract opportunistic predators. You can also see young cubs being trained to kill young wildebeests while adult wildebeests barricade around mothers and babies to protect them from harm. Cons: Because these months coincide with a couple of Western holidays, tourism is at its peak and so bigger tourist crowds can be expected and higher rates as well. As it is low season, prices drop considerably and visitors will be rewarded with lush vegetation that creates a beautiful green scenery made of scattered woodland and long-grass plains. By this time, the herds have begun to move north and west, although not all as one group. In April, most herds can be found in central Serengeti and then by May when the long rains begin to dwindle. The herds split in two: some of them head to the northern Seronera region while most of them continue to enter the Western Corridor, specifically in the Ndoha and Dutwa Plains that flank the Mbalageti River Valley. By the end of the month, the herds in the Western Corridor get ready to course down Mbalageti and Grumeti. Cons: Long rains usually start around late March but April and May are the wettest months in the Serengeti. Aside from the rains that may be experienced the whole day, some roads may become impassable and some lodges may also close. Between May and July, testosterone-filled male wildebeests pursue their females and they undergo the wildebeest mating season. The movement becomes slow during this time as they form into “mega herds” and prepare for their first major feat: crossing of the Grumeti River. The smaller herds heading north continues to move towards Ikorongo Game Controlled Area. Cons: Being the highest tourist season, expect prices to soar and crowds to multiply especially around the rivers as people wait in anticipation of the grand river crossing event. Dubbed as “The Greatest Show on Earth”, the Mara River crossing is one spectacular event every person must see in his lifetime. 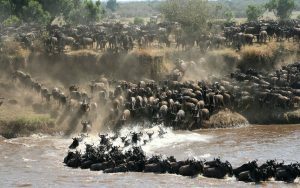 You see, when the migratory mega herds cross the Grumeti River, they move forward following the smell of fresh grazing in the Mara. To get to the other side, they have to cross the large, deep Mara river which is — guess what — infested with large Nile crocodiles and strong hippos. Lions and other predators also await them. This dramatic river crossing guarantees an adrenaline-packed experience as you see mega herds struggle for survival against predators, starvation and exhaustion. Hence its reputation as “The World Cup of Wildlife”. You can also see vultures and storks feeding on wildebeest corpses that drowned in the river. As early as August, some herds already reach the western side of Masai Mara and you can see the last batches arrive in October. 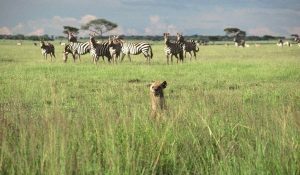 As the grasses in the Mara become too depleted and the short rains in Tanzania begin, the herds move back to the southern Serengeti plains for fresh grazing and water. Adult female wildebeests also get ready for their birthing season. Cons: Short rains are to be expected during these months although it usually doesn’t affect game-viewing because the rains pretty much happen early in the morning and rarely takes an entire day. Also, December is usually “vacation month” for almost everyone in the world so it is also apt to expect more crowds during this time. An unforgettable safari experience either way. Indeed, the Great Migration is a once-in-a-lifetime experience no matter which month you decide to go. Whether it is the calving season you’re going to see or the dramatic river crossing or even just the normal animal movement on other months, you will surely have the extraordinary safari experience beyond your wildest dreams. Check out these remarkable tours for the Great Migration! Next postDestination Wedding in Tanzania? Why not!